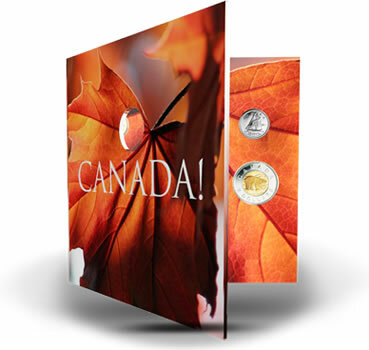 The Royal Canadian Mint is pleased to introduce a newly crafted array of gold, silver and base metal keepsakes as it launches its first collector coins of 2011. This highly anticipated collection is headlined by the 2011 Proof Silver Dollar, Brilliant Uncirculated Silver Dollar and Proof Set, which celebrate the conservation of Canada’s natural treasures on the 100th anniversary of Parks Canada. Other favourites among this year’s newcomers include the Mint’s annual releases of $100, $200 and $300 gold coins; a new 1/25 oz. 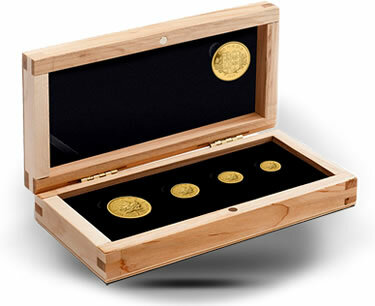 pure gold coin; uncirculated and specimen coin sets; and finely engraved gift sets. The Mint is also proud to mark the 100-year history of its world-class gold refinery with an exclusive Gold Maple Leaf fractional coin set featuring a special commemorative medallion. "Canada’s heritage, culture and values are a rich source of inspiration for the creative and innovative coins the Royal Canadian Mint looks forward to offering collectors every year," said Ian E. Bennett, President and CEO of the Royal Canadian Mint. "The finely crafted gold, silver and base metal coins we are introducing in 2011 once again celebrate the greatness of Canada in keepsakes that will be prized for their meaning as much as their craftsmanship." The following summarizes the featured products now available to the public. The first of many public railroads which would eventually link Canadians from coast to coast saw the light of day when the Dorchester locomotive engine entered service in 1836 on the new Champlain and St. Lawrence Rail Road. This technological leap forward, linking the St. Lawrence Valley with Lake Champlain and shortened travel between Montreal and New York City, was the brainchild of ambitious Montreal entrepreneurs led by famous brewer John Molson. The railroad’s first engine, the Dorchester, graces the Mint’s newest 14-Karat $100 gold coin and honours one of Canada’s most influential industries. The Mint’s talented engravers carefully adapted a painting of the Dorchester by late Canadian artist J.D. Kelly (1862-1958) to the reverse design of this coin, which is limited to a mintage of 3,000 and retails for $639.95 CDN. Long a source of national pride, many of Canada’s breathtaking wilderness areas have been preserved for the enjoyment of current and future generations thanks to the world’s first national parks system. This network of important natural sites was created 100 years ago when the Dominion Parks Branch, later named Parks Canada, was founded. 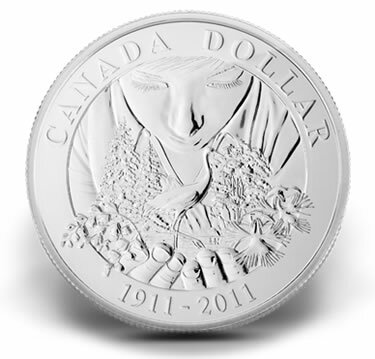 This important centennial is celebrated on the 2011 Mint’s Silver Dollar, available in proof or brilliant uncirculated finish and crafted of sterling silver. This flagship of the Mint’s annual collector coin program can also be found in a selectively gold-plated version, found exclusively in the Mint’s 2011 Proof Set. Limited to a mintage of 40,000, the 2011 Proof Silver Dollar is available for $55.95 CDN. The brilliant uncirculated version of this coin also retails for $49.95 CDN and is limited to a mintage of 25,000. Only 55,000 Proof Sets are available world-wide with a retail price of $114.95 CDN. 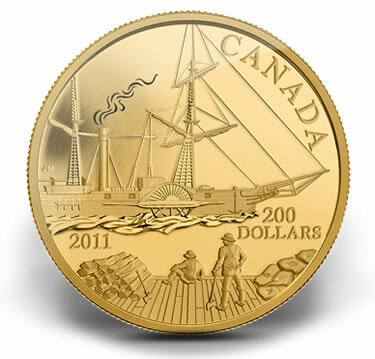 The final coin in the Mint’s seven-year Historical Commerce 22-karat gold coin series celebrates the power of steam with a tribute to the sail-and-steam hybrid S.S. Beaver. Commissioned as a supply ship by the Hudson’s Bay Company, S.S. Beaver sailed from Blackwall, England to Fort Vancouver, near present-day Portland, Oregon, USA in 1835. 225 days after its maiden voyage, the Beaver was fitted with its steam-powered paddle wheels, heralding the arrival of the steam age on North America’s Pacific coast. The Beaver was chartered by the Royal Navy to map the British Columbia coastline from 1862 to 1871 and ended its Hudson’s Bay Company service in 1874 when it was sold as a freighter and tow boat. It met its end 14 years later after foundering on rocky shoals at Prospect Point at the tip of Vancouver’s Stanley Park. While only pieces of the Beaver survive at the Vancouver Maritime Museum, the Mint has restored the ship to its full glory on the 2011 22-Karat gold coin. This proof-quality gold coin, featuring laser-etched enhancements to the S.S. Beaver design by artist John Mardon, is limited to a mintage of 2,800 and retails for $1,079.95 CDN. The Mint’s 2011 edition of the official $300 gold series of Coats of Arms of Canada’s provinces and territories celebrates Manitoba, home province of the Mint’s Winnipeg facility, from which all of Canada’s circulation coinage, as well as that of many other foreign countries, is produced. This impressively oversized coin is a majestic tribute to Canada’s "keystone" province bridging the eastern provinces of Canada with its emerging western territories when it gained provincial status in 1870. Distinguished by an iconic Prairie Buffalo and the inspiring latin motto "Glorious and Free", the Manitoba Coat of Arms adorns the reverse of this proof 14-karat gold coin with a $300 face value. 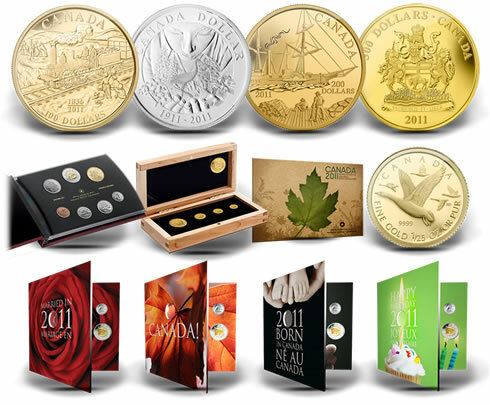 Only 500 of these coins have been minted, each available at $2,429.95 CDN. Today, the Royal Canadian Mint is admired for its ability to refine the purest gold in the world and for reliably meeting unprecedented demand for the investment community’s most respected gold bullion products. 100 years earlier, the Mint’s gold refinery was opened in response to a different sort of gold rush, as Canada overcame the struggle to process the influx of gold being mined in British Columbia and the Yukon Territory and a surging demand for gold coins. 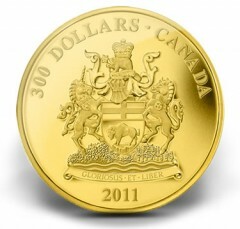 Over the last 100 years, the Mint has carved a reputation as an industry leader by setting benchmarks such as the introduction of the Gold Maple Leaf (GML) bullion coin in 1979; the world’s first 99.99% pure gold introduced on the 1982 GML; becoming the first mint in the world to refine gold to 99.999% purity and creating the first "5-9s" gold bullion coins, culminating in the world-record 100 kilo 99999 pure Gold Maple Leaf bullion coin in 2007. The legacy of a century of excellence and innovation in the field of gold refining is captured in a very exclusive set of 1911-2011 double-dated Gold Maple Leaf coins of 1 oz., ¼ oz., 1/10 oz. and 1/20 oz., accompanied by a gold-plated 99.99% pure silver commemorative medallion. The medallion features the majestic exterior of the Mint’s Ottawa facility, home to the gold refinery since 1911. The other side of the medallion features the shield and maple leaf wreath design of the first Canadian gold coin struck at the Mint in 1912. Only 750 of these sets exist world-wide, each retailing for $3,739.95 CDN. 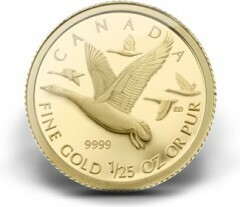 With a stature far outweighed by its popularity, the Mint’s 1/25 oz 99.99% pure gold coin returns in 2011 with a lively engraving of a flock of Canada Geese. Often dominating Canadian skies every spring and fall, this species is a timeless symbol of Canada’s abundant wildlife and a veritable Canadian trademark. A giant statue of a Canada Goose in the Northern Ontario community of Wawa has even become one of Canada’s most famous roadside attractions. 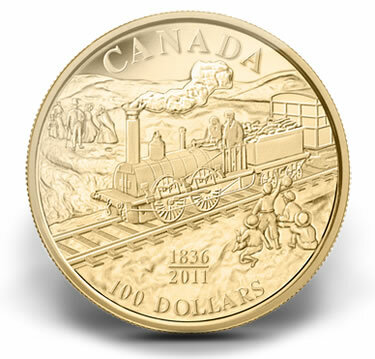 Limited to a world-wide mintage of 10,000 coins, this miniature work of art retails for $109.95 CDN. The avian celebrities who have appeared on the Mint’s annual specimen sets welcome the Great Gray Owl to their prestigious menagerie, as one of the world’s largest owls assumes a place of honour on the 2011 Specimen Set limited-edition aureate one-dollar coin. 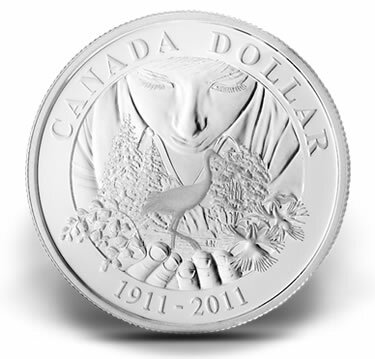 Designed by Ontario artist Arnold Nogy, this coin is accompanied by specimen versions of all of Canada’s traditional 2011 circulation coins (with the exception of the Common Loon $1 coin). The limited worldwide mintage for this popular set is 35,000, and it is available for $49.95 CDN. 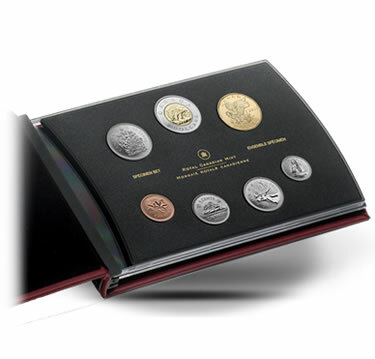 Another collector favourite, whose 2010 edition completely sold out, is the Mint’s perennial Uncirculated Set. The Mint has produced 55,000 of these sets for 2011, which feature all of Canada’s circulating coins, produced using the Mint’s patented multi-ply plated steel technology. 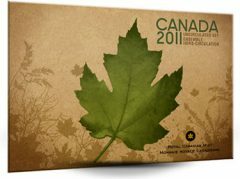 The 2011 Uncirculated Set sells for $23.95 CDN. 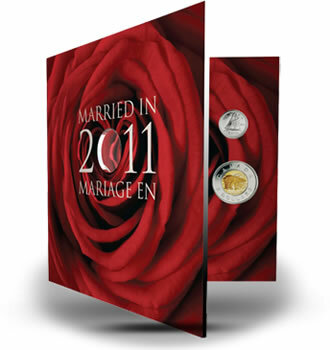 The Mint’s 25-Cent Coin Gift Sets are popular gift ideas which return in 2011 to celebrate Baby, O Canada, Wedding and Birthday. Making something old new again, these coins are classically engraved rather than painted, as has been the fashion of prior years. 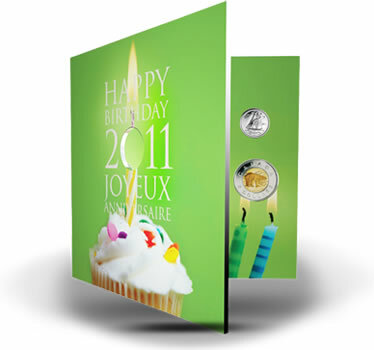 The unique 25-cent coins appear through a die-cut in the cover of the collection folder, which also holds all of Canada’s 2011 circulating coins. Each set retails for $19.95 CDN, while supplies last. 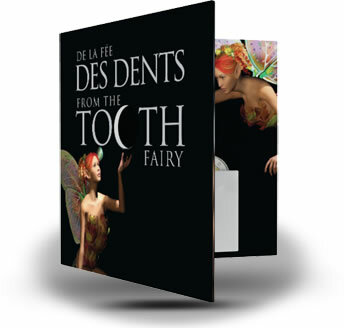 A new twist on an old tradition is the introduction of a Tooth Fairy gift card featuring an elegantly engraved tooth fairy design on the reverse of a multi-ply plated steel 25-cent coin. This coin is embedded on the cover of the card which contains a printed rhyme to the Tooth Fairy; space to write a personal message; and a detachable envelope to place a coin under a child’s pillow in exchange for his or her tooth. This innovative memento is available until quantities last for the retail price of $9.95 CDN. All of the Mint’s products are available directly from the Mint at 1-800-267-1871 in Canada, 1-800-268-6468 in the US, or on the Internet at www.mint.ca. The coins are also available at the Royal Canadian Mint’s boutiques in Ottawa and Winnipeg as well as through our global network of dealers and distributors. America the Beautiful coins to go on sale at AMARK One HOUR ago. There page is up but not functioning. There phone rings and rings with no one picking up…No one there answering E-mail either. Anyone having any luck with AMARK ? ?